Why isn’t it Spring yet? Snow is on the ground, the garden is brown and sleeping, and I’m thumbing the Sutton’s 2018 seed catalogue impatiently. Sometimes my eyes glaze over and I catch myself drifting off forward in thoughts of filling seed trays, potting up, and bright spring sunshine. 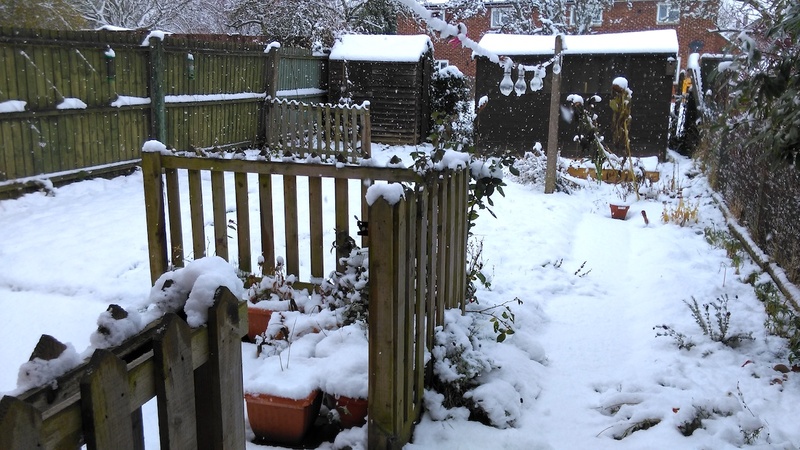 The back garden is covered in snow. I’m lacking in the TARDIS department, so I return to the cold winter window view of 2017, knowing that at least my planning will be good. Over the last year I’ve been tuning in to videos by Vivi, who has been allotmenting for years, but in 2017 she put herself out of work and aimed to become self sufficient. Her videos have kept me inspired to keep gardening, to keep trying when it doesn’t quite go to plan, and also to try growing new things (as well as making soups!). She inspired me to grow squashes after watching her harvest a wheelbarrow load off her allotment, so in 2018 I shall be growing some new things… well, new to my gardens anyway. I bet i’ve tried growing carrots before – i mean, who hasn’t? But the harvest can’t have been successful as I’d have remembered what happened. The latter of the three firsts are those ‘vintage’ kinds of carrots – the yellow, purple, red and orange kinds. So these will be fun to grow. The ‘Flyaway F1 Hybrid’ carrots should, as their name suggest, be ‘fly-away’ for the carrot fly larvae. Turnips are completely new to me, and I don’t remember them growing on my parents garden either. I’m really into roasting veg, so I shall be roasting these snowy white turnips. I think I can also eat the tops too. I’ll also be growing a range of Peppers, because I’ve realised that I use quite a lot of these in my cooking – far more than tomatoes, so I shall swap to growing those instead. And what I’m sure will be a mixture of disbelief and amusement of my mother, I’ll also grow some Broad Beans in 2018. From what were bland-tasting, smelly warts as a child, after 30+yrs, I finally realised that they’re actually quite tasty, healthy, and filling. I know that you can get varieties that can be sown in Autumn, but having missed that boat, I’ve got my eyes on some Spring varieties like Crimson Flowered or Listra instead. Thankfully, you can get away with sowing these as early as February. But I’ve got to wait to sow the rest of these seeds. Months. Instead of Christmas shopping (it’s December after all), I ended up on the “1 present for you, 2 presents for me” routine at a local garden centre. Oops. I came home with two packets of seed and a propagator. 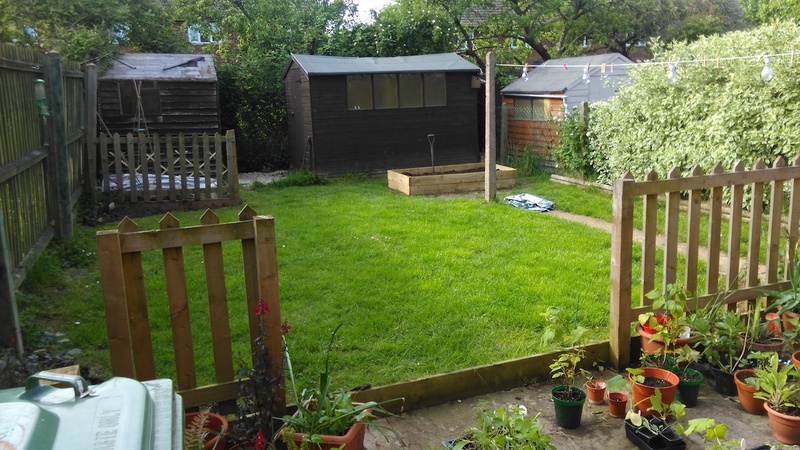 Once it’s dry enough, I am going to demolish an old little shed in the back corner of my garden. There’s a much bigger and newer shed opposite it, and I don’t have enough junk to fill both. How this little shed has survived the gales of 2017, it’s anyone’s guess. It has no felt, the door regularly swings open, and I think i could push it over with one generous poke from my index finger… yet still it stands. The little shed on the left is going to get it! My plan is to carefully remove the pane of glass (I think it’s glass anyway), and then deconstruct it so that I end up with a pile of planks. I then want to recycle it into raised beds, as my one from last year really worked well. The end of April 2018 will signal the end of my first year in this house, and hopefully by then, I’ll have worked out how areas of my garden perform, and will be able to plant appropriately. For now though, I shall continue watching the winter garden, feeding the birds, and dreaming of warmer, greener months ahead.